The library collection is housed in a spectacular structure incorporating two wings. The Feehan Memorial Library is the original building, completed in 1929. The library is named in honor of Archbishop Patrick Augustus Feehan (1829-1902). The funds for the construction of the library were a gift from many of the men whom he ordained. Upon entering the building the visitor is thrust into the sublime interior of a sixteenth century Italian palace. The central court is surrounded by three stories of arcades. The tables and bookshelves are made of walnut. Each of the reading tables bears Cardinal Mundelein's coat of arms, as do the ceiling beams. His coat of arms includes representations of symbols of the Blessed Virgin Mary, and in the lower left quadrant, three bees. The bee motif is a part of the heraldry of the Barberini family. Cardinal Mundelein completed his seminary training at the Propaganda Fide College which was located in what had been the Barberini Palace. The Barberini family generously sponsored part of the Cardinal's education. Cardinal Mundelein incorporated the three bees into his coat of arms. 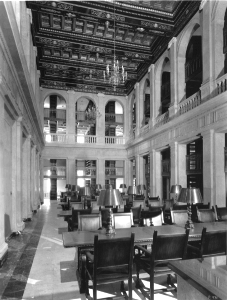 In addition, he used the design of the Propaganda Fide College library as a model for the interior of the Feehan Memorial Library. This facility was augmented with the addition of the McEssy Theological Resource Center in 2004. Named for benefactors William and Lois McEssy, the new library space houses the heart of the Library's collections---theology, scripture studies, and the history of Christianity and the Roman Catholic Church. Feehan Memorial Library and McEssy Theological Resource Center notable collections include patristics, canon law, scripture, systematic theology, and church history. The library provides a comprehensive history of the world's scholarship in theology and philosophy. The Digital Collection of the University of Saint Mary of the Lake has early photos of the campus, dignitaries, and the 28th Eucharistic Congress held at USML. The Edward F. Carry Collection of Irish literature, religion, history, and genealogy. Browse the catalog to look at materials in the Carry Collection.